All day ticket holders / visitors must then leave site. All Visitors Must Report to Tackle Shop/Reception. Strictly barbless hooks only. (not crushed or filed). Stags lake: maximum hook-size 4. Otter’s/Oaktree lakes: maximum hook-size 8. All Nuts are banned. (unless manufactured baits). Use of bait-boats, please ask. Use your own landing nets/mat/slings, ( large net/mat on Stags). All Nets / keep nets must be dipped, Please ask on day use of keep nets. Particles can be used in moderation, (No-nuts) Please check on day. Must have your own landing nets/mat’s per-person. Keep nets for silver fish (banned at certain times so please ask before using). 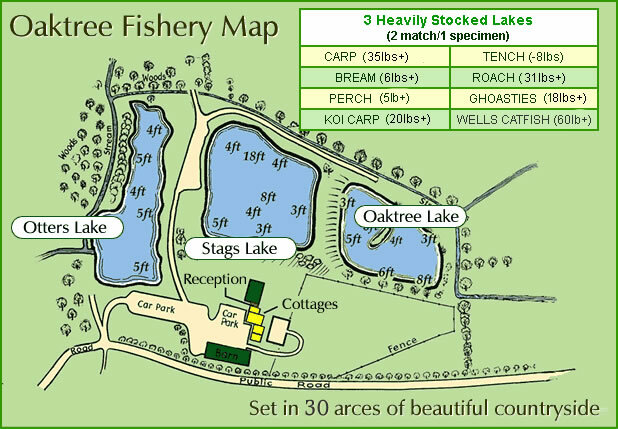 2 rod limit on Otter’s and Oaktree lakes (Stags lake see tariff). Any one under the age of 16yrs fishing on Stags lake must be with an adult. All rubbish to be separated and placed in recycle bins at entrance car-park or Please Take Home. Toilets, Only use the Toilet’s provided (not bushes), Situated at the end of green barn. All Children under the age of 16yrs, Must be accompanied by an adult at all times. No one under16yrs to be left over night on site without an adult. stone pegs/paths, Unhooking mats must be used at all times. the rules will be asked to leave the fishery immediately with no refunds. No antisocial behaviour / Consideration and Sportsmanship to be given to other anglers at all times. All fish caught are to be returned to the lake ASAP. (Our fish are micro-chipped). Removal of fish from the site or to different lakes will result in prosecution. Fish welfare and safety Are of uppermost importance, if you are in any doubt what so ever please ask. (must be cleaned up after and disposed of in our dog bin). Terms of Reservation: Deposit of £20 pw per pitch is required on all bookings. **Electric Cables not supplied (hire available). Passing nightly stays welcome on arrival. Dogs are welcome and are charged at £2.00 per night (must be cleaned up after and placed in dog bin).